This little block took awhile to piece, but I love how it turned out! It’s F2-Kaleidoscope for my Dear Jane quilt. It looks a little puckery here, but that’s only because of the way the scanner squished it to take its picture. It turned out so nice and flat. Do these colors look familiar? They are left over from my Paper Lanterns quilt. 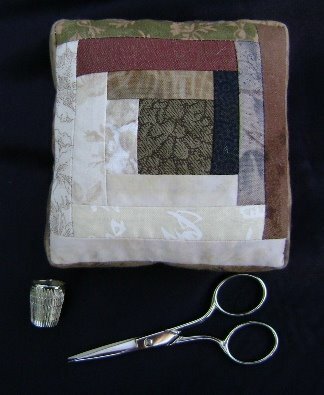 I offered a giveaway after posting hints about the quilt, and JoAnne won this little pincushion. 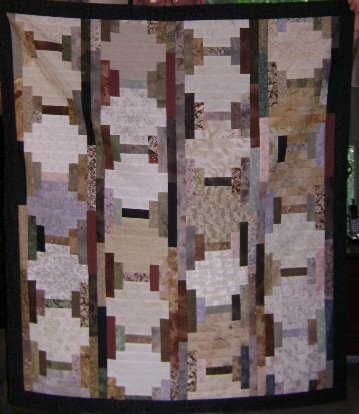 I am amazed by the quilts produced by Diana of Diana’s Art Quilts. Visit her Etsy shop by clicking on the link, and then see her slide show here. You should recognize this man… I just know you’ve seen him before!!! 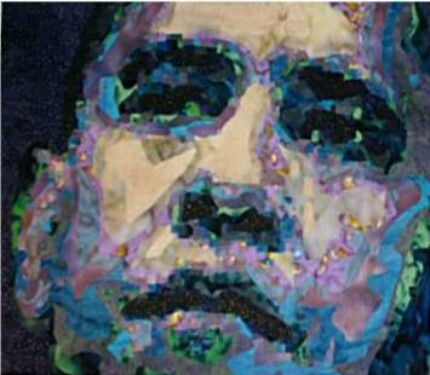 Can you believe this is a QUILT? She is also a member of the DESIGN STYLE GUIDE – INTERIOR DESIGN ETSY TEAM that I also belong to. Please check it out. 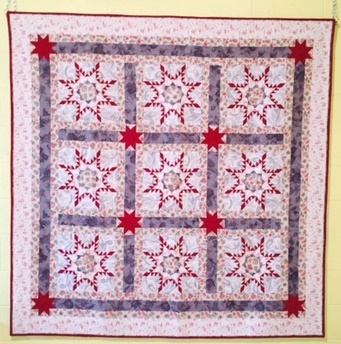 Wow, your dear jane block looks awesome! 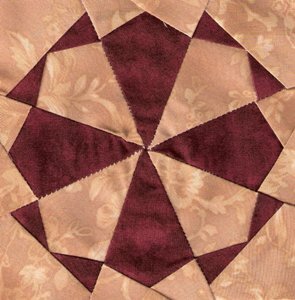 I need to get back to my own dear jane quilt sometime…ah…after I finish my sister’s baby quilt. You do inspire me to work on it though. Beautiful block! Caron, I love my pincushion! It is sitting on the table by my recliner where I stitch at night and is getting lots of use. Log cabin is one of my favorite blocks so it’s perfect. Thanks, again. Love the dear jane block. And the pincushion, how sweet. Lucky Joanne. Oh my, that block looks like a HARD one, but yours look great! I am so impressed.